인천광역시 강화군 하점면 봉천산 아래에 자리잡은 고려시대의 석조불상이다. 두꺼운 화강암의 판석에 돋을새김으로 했는데, 현재는 전각을 만들어 그 안에 모시고 있다. 민머리의 정수리 부분에는 상투 모양의 작은 머리(육계)가 솟아 있다. 타원형의 얼굴에는 살이 올라 있는데 눈·코·입의 표현이 다소 둔중해 보인다. 귀는 비사실적으로 길며, 목이 짧아 3줄의 주름인 삼도(三道)가 가슴까지 내려와 있다. 양 어깨를 감싸고 있는 옷은 두껍게 표현되어 신체의 굴곡을 드러내지 못하고 있으며, 좁고 둥글게 처리된 어깨선으로 인해 불상은 어딘지 모르게 움츠러든 모습이다. U자형의 옷주름은 가슴에서부터 흘러내려 무릎 부분까지 표현되었는데 형식적이며 간략하게 처리되었다. 오른손은 허리 아래로 내려 손바닥을 밖으로 향하고 있고, 왼손은 가슴 앞으로 들어 손가락을 구부리고 있다. 불신의 주위에는 2줄의 도드라진 선으로 몸광배와 머리광배를 구분하고 있다. 2줄 사이에는 드문드문 둥근 구슬을 새겨 넣었으며, 머리광배와 몸광배의 가장자리에는 불꽃무늬를 새겼다. 평판적이고 선으로 조각하는 경향이 두드러진 불상으로 모든 면에서 단순화, 생략화 되는 점은 시대가 내려가는 것을 말해준다. 양감이 있는 얼굴, 짧은 목, 움츠린 어깨, 형식적인 옷주름 등에서 고려시대 불상의 특징을 잘 나타내고 있는 작품이라고 할 수 있다. 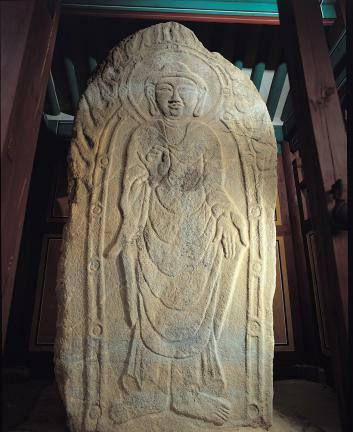 This Goryeo-period stone Buddha is located at the foot of Bongcheonsan Mountain at Hajeom-myeon, Ganghwa-gun, Incheon. 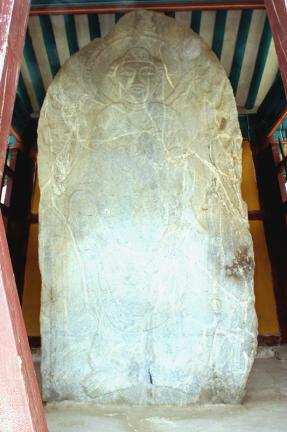 The bas-relief Buddha is realized on a thick granite slab and is currently placed inside an open pavilion that was specially built to shelter it. 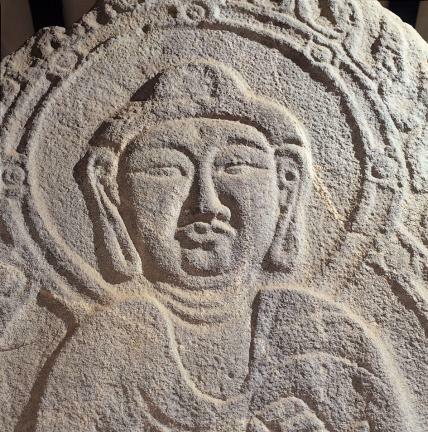 The Buddha figure has a small ushnisha at the top center of the head and a plump face that is oblong in shape. The facial features including the eyes, nose and the mouth are a bit squat and thick. The ears are unrealistically long, and the neck is so short that the three lines on it extend almost to the chest. 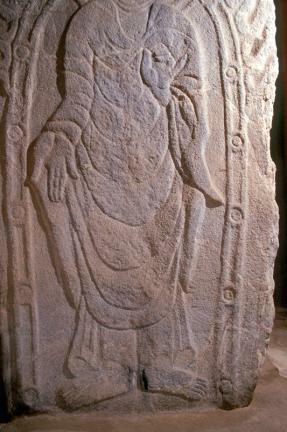 The robe enveloping both of the two shoulders is thick with no body lines appearing through it. 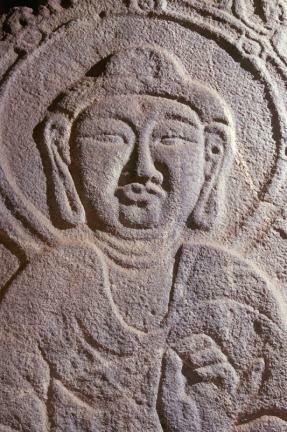 The narrow, rounded shoulders make this Buddha appear slightly huddled. Garment folds, shaped like the letter ‘U,’ begin at the chest level, continuing down to the knees. The drapery is rendered overall quite cursorily. The right hand held down to the level below the waistline has its palm turned outward. The left hand is held up at the chest level with fingers bent. The mandorla is outlined by two thick embossed lines, and the nimbus around the head is separate from the aureola around the body. Round bead-like motifs are placed between the two lines, at regular intervals. The mandorla has flamed edges. 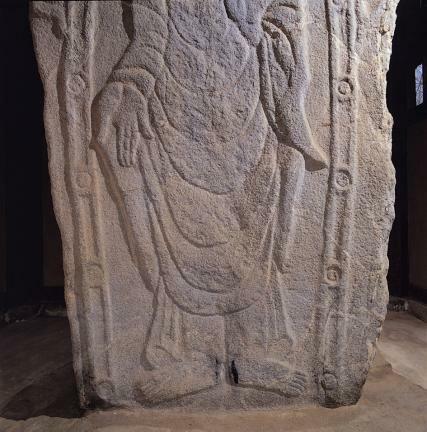 This bas-relief Buddha is two-dimensional and lacks depth, with a strong tendency toward simplified treatment of details. 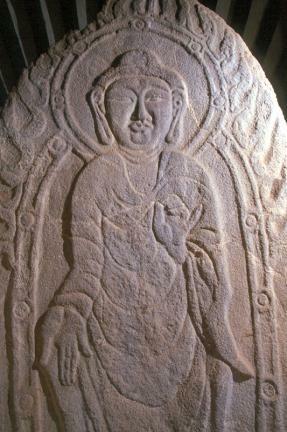 Meanwhile, such elements the face projecting a good sense of volume, short neck, huddled shoulders and the cursorily-rendered drapery make it a typical Goryeo-period Buddhist sculpture.